On Friday, January 20th, 2017, at a minute past noon exactly, Donald J. Trump was inaugurated as President of the United States. President Trump is, of course, a man known for both his showmanship and his ego. Trump was a large factor in drawing record and near-record viewership ratings during the Republican Primary debates. The first debate between he and Hillary Clinton was the most-watched in the history of televised Presidential debates. During the campaign, he spent a great deal of time talking up the size of the crowds at his rallies, as well as the size of… uhm… other things. Size became a factor again when comparisons of the crowd at President Trumps inauguration late last week and President Obama’s first inaugural 8 years ago came quickly from the media (History has shown us that second inaugurals generally have far less hype than first inaugurals). 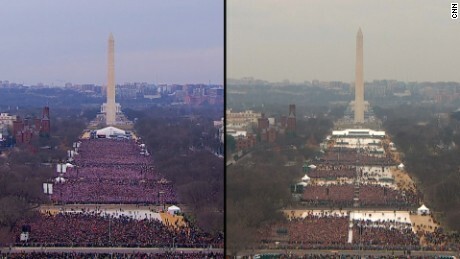 While it is extremely difficult to exactly estimate the size of a crowd on the National Mall, side by side photographs seem to show clearly that President Obama’s first inauguration had far greater attendance than President Trump’s. Viewership ratings for this most recent inauguration were also dismal, reaching 30.6 million total viewers, down 18% from President Obama’s first swearing-in in 2009, and only barely edging the 29.7 million people who watched President Clinton’s first inauguration in 1993, despite the fact that not only are there more people in the country, but also that internet streaming is now a major factor in accessibility of viewership, unlike in 2009 and 1993. The fact that Trump felt the need to rise to the defense of Little Donald on live television should have told us all we needed to know about his personality. It should also be no surprise, knowing his vapid narcissism, that he would fly to defend the perceived level of interest in his inauguration. As early as Friday, media outlets began running stories of comparatively low turnout for the inauguration. Additionally, WMATA (Washington Metropolitan Area Transit Authority) released ridership figures as of 11 a.m. on inauguration day, showing a 12-year inaugural ridership low. According to crowd scientists interviewed by the New York times, there were only about 160,000 people on the mall itself, in addition to what the Trump administration claims was 250,000 people in the “invite only” area on the constructed platform and at the base of the Capitol Building, for a maximum probable total of 410,000 (For what it’s worth, we’ve have been to the Capitol grounds many times, and genuinely don’t believe there is room for a quarter million people on Congress’ back lawn). On Friday, when the National Parks Service tweeted side-by-side photographs comparing the two inaugurations, the newly minted Trump Administration ordered the NPS digital team to cease tweeting until they received further instructions Monday. But, you know, we have something that’s amazing because we had — it looked — honestly, it looked like a million and a half people. Whatever it was, it was. But it went all the way back to the Washington Monument. And I turn on — and by mistake I get this network, and it showed an empty field. And it said we drew 250,000 people. Now, that’s not bad, but it’s a lie. Let the image of that sink in. With the backdrop of a memorial wall dedicated to fallen, unknown heroes, and while staring at a wall proclaiming the merits of truth, in a room full of INTELLIGENCE OFFICERS, President Trump pushed a falsehood to make himself look better for what seemed to be the sake of vanity (CBS is now reporting that the crowd at the CIA was packed with supporters to cheer and laugh, and may have worsened Trump’s relationship with the CIA). Yesterday at a time when our nation and the world was watching the peaceful transition of power … members of the media were engaged in deliberately false reporting … photographs of the inaugural proceedings were intentionally framed in a way in one particular tweet to minimize the enormous support that had gathered on the national mall … This was the largest audience to ever witness an inauguration — period — both in person and around the globe … these attempts to lessen the enthusiasm of the inauguration are both shameful and wrong. Ultimately, Spicer went on to claim that at least 720,000 people had attended the inauguration. (The link to the full video of the press conference is here). Spencer spent the overwhelming majority of the short, roughly 6 minute press conference, berating the press, at some points raising his voice to a yelling level, and then did not take any questions at the end. Trump himself concluded this three-act performance the next day by tweeting about how great the television ratings for his inauguration were. It is truly impossible for us to overstate the importance of these events. Nothing, and we mean nothing, is more important than the truth from our government. If you disagree with us so far, if you think what we’ve said to this point is crazy or biased, remember this: everything we’ve stated so far has been fact, free of our own opinion. And if you think it’s insignificant, please give us another five minutes of your life and keep reading. To dismiss the events of the last few days as nothing more than petty score counting ignores the underlying and troubling nature of the discourse. The words spoken by President Trump and Press Secretary Spicer can be called nothing other than what they were: cold, blatant, willing, lies. In the words of Albert Einstein, “Whoever is careless with the truth in small matters cannot be trusted with important matters.” By contradicting press accounts over verifiable facts, insisting that their version is the truth and widely reported press stories are falsified or biased, they are creating a precedent. By openly calling the press “shameful and wrong” they have codified a precedent with their supporters that they have spent months crafting, that the press is not to be trusted. Trump and Spicer are maliciously and intentionally laying the groundwork with which they will discount negative press stories later. Later, with no more than the simple hashtag #FakeNews, they will create a rift in the nation, where their supporters will believe what they say, their detractors will not believe it, and the rest of the nation will be left to believe that the truth is simply unknowable. This is unconscionable. Facts are objective. The truth is important. And it is absolutely critical when it is coming from people of power. It is the press’ role to hold the government accountable, and the American people deserve a press which is allowed productive cooperation from the Office of the President, not an adversarial President and Press Secretary who berate and admonish the press from their bully pulpit, and then retreat back behind closed doors without taking a single question. The truth is important, even in small matters, and it is clear that the Trump administration is uncommitted to the truth in matters of any size. We remain committed to that goal. Our commitment to research and data are unwavering. Our mission to provide you, our reader, with intelligent, informed writing is unchanged. To that mission we add only this: our ultimate allegiance is to fact, and facts are never a matter of opinion.